The nuclear disaster at Fukushima Daiichi in Japan was perhaps the worst of all time, but despite that ominous reputation, radiation risks to the surrounding population are surprisingly slight. Even the most affected individuals -- those who remained in highly contaminated towns within the 20-kilometer evacuation zone for four months following the disaster -- only have a faintly higher risk of developing cancer. Last year, the World Health Organization reported a "7% higher risk of leukemia in males exposed as infants, a 6% higher risk of breast cancer in females exposed as infants and a 4% higher risk, overall, of developing solid cancers for females." The WHO also reported that, for girls exposed as infants, 1.25 out of 100 will develop thyroid cancer, compared to the previous rate of 0.75 out of 100. By comparison, smoking raises the risk of lung cancer by upwards of 2000%. Now, a new study from a massive team of Japanese researchers shows that for people living more than twenty kilometers from Fukushima Daiichi, the elevated cancer risk is even more diminutive. Their results are published in the Proceedings of the National Academy of Sciences. 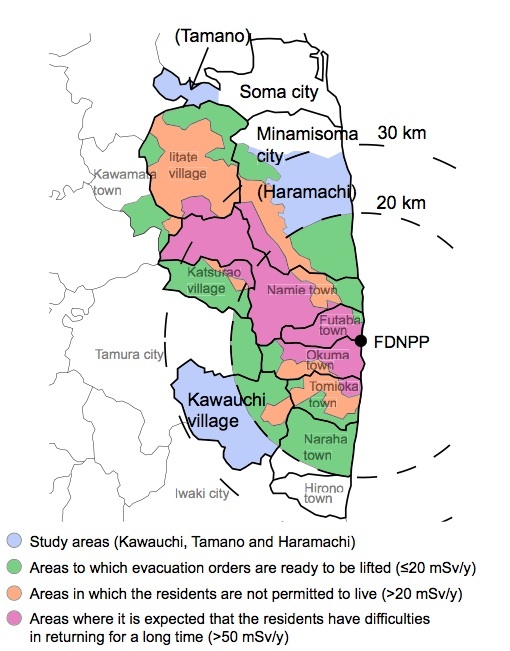 483 residents of the village of Kawauchi, the area of Tamano in the city of Soma, and the area of Haramachi in the city of Minamisoma wore dosimeters for two months during the summer of 2012. Radiation rates are naturally highest in the summer, as winter snow tends to act as a shield against terrestrial radiation. To get a complete picture, the researchers also examined radiation levels in another 131 subjects' food, and estimated the inhalation dose rate of radiocesium from aerosols. When all of those radiation sources were tallied together, the researchers found that the mean annual radiation dose rate in 2012 associated with the accident was between 0.89 – 2.51 millisieverts per year. Those levels are predicted to drop steeply by 2022, to just one-third of current levels. By comparison, Japanese people are generally exposed to a background radiation of 2.09 millisieverts per year. For that, they can thank a multitude of sources, including cosmic radiation and naturally occurring radon in the soil. In terms of public health, the radiation exposure from Fukushima Daiichi poses negligible risks to those in the studied areas. Residents of Tamano, where radiation measurements were highest, are predicted to have higher lifetime rates of solid cancer, leukemia, and breast cancer by 1.06%, 0.03% and 0.28%, respectively. Sadly, the Fukushima-Daiichi disaster has rendered certain areas around the ruined power plant unlivable indefinitely. But thankfully, the overwhelming majority of Japanese people appears to have been spared from any harmful levels of radiation.